Microsoft rebranded and launched the Accompli’s highly-praised app on January 29, 2015. This new application is called Outlook for Android. If you use Microsoft Exchange Server,you should give it a close look. Fourth day on my new job and my boss, a mail client and IT guru, tells me to download and setup Outlook for Android. After he finished rolling his eyes as I loaded a micro SD card into my bottom-of-the-line Android phone (without which, I didn’t have enough memory for the app). App download, install, and setup was brief and simple. In the last two decades I have dealt with many UI’s--from the earliest Macs to Windows and even a few others thrown in. Some have been like stroll in the park, and some have been like clawing my way up Everest. Among these experiences, Outlook for Android is sublime. A tap on the envelope logo leads to a “new email” screen. 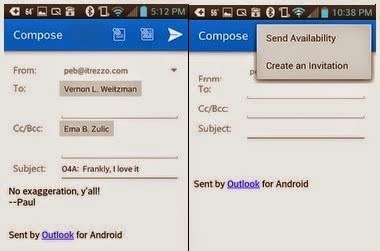 The envelope icon to the right allows an email to be sent to that person using the application’s compose screen.